Something as innocent as indulging in an extra long steamy shower or letting a leaking pipe go unchecked could quickly develop into one of the biggest threats to your home and your health. Mold is a form of fungus that can grow in our homes when excess moisture is allowed to gather in unventilated areas. Everyday homeowners unknowingly bring in spores from the outside environment that can eventually grow into a fuzzy material you may have previously spotted in your shower or in the basement. Mold can grow on virtually any surface, although porous materials such as wood and fabrics are much more susceptible. Most people can easily identify the common forms of mold that develop on old food in their refrigerator, typically fuzzy and grey in appearance, but mold can be a wide variety of colors and textures, some more deadly than others. Mold can be extremely destructive to your home, decaying and deteriorating materials such as drywall and wood flooring, which can result in thousands of dollars in damages. Personal belongings can also be affected, important documents or artwork are often a favorite material for mold to grow its spores on. Often when mold is spotted, on the ceiling tiles of a bathroom as an example, this may only be a glimpse of the total problem. If an area has been exposed to moisture long enough, mold may be growing unchecked behind the walls or in the ceiling. 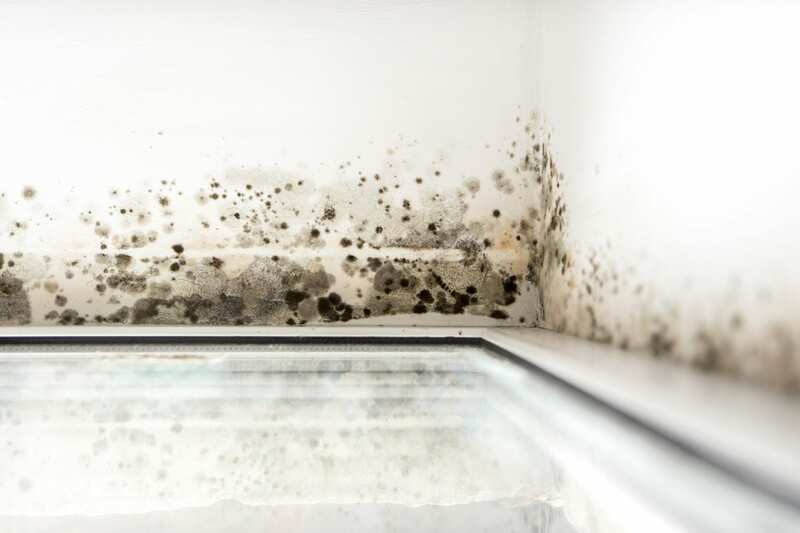 The destruction of physical materials in the home displays some of the most obvious results of mold, however, the most dangerous effects of mold are how the fungus can negatively impact your health. Most people spend more than half of their lives inside their home, and if that home is full of mold, you can develop some serious long-term side effects. Medical professionals are still trying to understand the full extent in which mold negatively impacts our bodies, but recent research indicates that it is much more dangerous than we previously thought. There was even a documentary created in 2015 called “Moldy” that explored the topic of how mold is the secret cause of many of our ailments. When mold has found a suitable spot in your home to grow, it will begin to release spores into the air in an attempt to spread further. When these spores are ingested by the respiratory system, a whole slew of health concerns can follow. Typical symptoms are the development of allergies, which can cause a runny or stuffy nose, sneezing, watery eyes, and the swelling of the sinuses. Mold has also been known to bring on the condition and symptoms of asthma, making the simple task of breathing in your own home a challenge. Living in an environment contaminated by mold for extended periods of time also increases the risk of developing common colds, bronchitis and pneumonia. These health risks have been recognized for many years but more recently there has been a whole new list of medical dangers which have been linked to the chemicals in mold, commonly referred to as mycotoxins. If exposed to mycotoxins, you could experience weight gain, brain fog, mild hallucinations, chronic fatigue, depression, and anxiety. The list of possible ailments associated with mold exposure is constantly growing. The good news is that without moisture, mold is unable to grow and replicate, so the key to keeping a house mold free is to control the humidity. One of the most obvious sources of moisture is a large spill or leak in a confined area. It is paramount that a leak is cleaned immediately, ensuring that all waterlogged materials are dried completely. Once the source of a leak is determined, it is important to remedy the leak, but also to seek out the original source of the problem. If the issue is with the major plumbing system of your home, it is best to get the help of professionals to ensure to issue is properly resolved. A less obvious source of moisture but often the more common culprit is condensation. When warm air comes into contact with a colder surface, such as a pipe or a window, the natural moisture in the air will be left to collect on that surface. If condensation appears in an unventilated area frequently, you can be sure that mold will soon develop. To prevent condensation you should ensure that your home is properly insulated, utilizing materials and methods that keep your house at the correct temperature while also allowing moisture to escape in the correct areas. It would also be beneficial to install fans, ventilation systems and dehumidifiers in areas where moisture is often created such as in washrooms or a kitchen. Due to the hazards associated with mold, if you do discover a major source, professional services should be sought out immediately to properly remove the contaminants, clean the area, and take the needed measures to ensure it does not return in the future. That small black spot above your sink may look insignificant, but it could be a indicator that your health is at risk, or that you may soon be faced with a hefty repair bill from the damage of mold. For more information make sure you Like our Page on Facebook. My brother recommended I would possibly like this web site. He used to be totally right. This post actually made my day. You cann’t believe simply how so much time I had spent for this information! Thank you! First off I want to say excellent blog! I had a quick question in which I’d like to ask if you do not mind. I was curious to find out how you center yourself and clear your mind before writing. I have had a difficult time clearing my thoughts in getting my thoughts out there. I truly do take pleasure in writing but it just seems like the first 10 to 15 minutes are wasted just trying to figure out how to begin. Any suggestions or hints? Appreciate it! You ought to take part in a contest for one of the highest quality sites on the web. I’m going to highly recommend this site! Hello everyone, it’s my first visit at this web site, and post is genuinely fruitful for me, keep up posting such content. Hello colleagues, how is everything, and what you want to say about this post, in my view its genuinely awesome in support of me. My spouse and I absolutely love your blog and find almost all of your post’s to be just what I’m looking for. Do you offer guest writers to write content to suit your needs? I wouldn’t mind creating a post or elaborating on a few of the subjects you write regarding here. Again, awesome website!